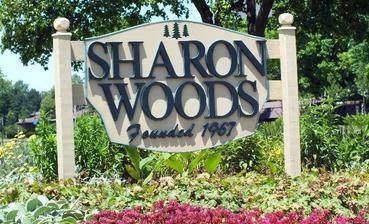 The Sharon Woods Civic Association geographical area is bounded on the south by Highway 161, on the north by Schrock Road, on the west by Karl Road, and on the east by Maple Canyon Avenue. The Association was founded in 1967 and is organized as a not for profit corporation and operated exclusively for the civic betterment of the geographical area listed above. Approximately 2,100 homes and condominiums are located within these boundaries. The Executive Board of the Association is the President, Vice President, Secretary and Treasurer. There are 12 Trustees that represent the various areas of Sharon Woods and they meet monthly (except August) with the Executive Board to conduct community business. Meetings are conducted on the 1st Thursday of each month. A community newsletter is published every 2 months (6 times a year) and is called The Gatepost. Local events, Block Watch information, advertising and general information on happenings in the community are published. The Gatepost is distributed to the 2,100 homes in Sharon Woods by Dispatch Services on the last Sunday in February, June, August, October and December. The April newsletter is distributed by officers and trustees in early May, door to door, for our annual membership drive. Membership in the Sharon Woods Civic Association is collected once a year and dues are $12.00 for general membership and $10.00 for seniors. We have been fortunate in keeping our dues very reasonable and it is because of members making additional contributions and fund raising events. Life is good in Sharon Woods. John R. Kirkpatrick is the NCC Representative and the President of the Sharon Woods Civic Association. He has been an officer, trustee, and NCC Representative in Sharon Woods for 15 years. John has a wife Luaine, a daughter Jennifer, a son-in-law and two grandchildren. He retired from active duty in the Ohio Air National Guard as a Lieutenant Colonel in 2005 after serving 23 years of active and 15 years of reserve time for a total of 38 years of military service, including 28 years working in Human Resources as a supervisor. He graduated from The Ohio State University in 1971 with a B.S. in Education. John has lived in Northland since 1947, having grown up on Cleveland Avenue just north of State Route 161. He has lived in Sharon Woods for more than 30 years.